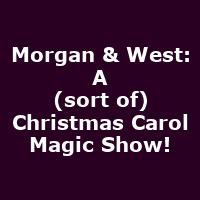 "The world's most distinguished duo of Time Travelling Magicians Morgan & West present Charles Dickens' timeless classic A Christmas Carol for ages 5+. The only problem is, they're baffled by the story. Well not just one problem, there are also only two of them to play all the parts. Oh, and Mr West is rather insistent on doing a magic show at the same time. How hard could it possibly be? There's fun in store for everyone in this utterly splendid (and totally silly) Christmas magic show!"